We’ve all heard of the amazing Groopdealz, right? They are an incredible deal site that works with handmade businesses to offer the most amazing and creative products ever! My love for Groopdealz stems from more than just seeing (and purchasing) great items. Some of my closest blogger friendships began with my very first Groopdealz purchase. Early last year I was new to blogging. I started seeing information online about the first Creative Estates conference in Chandler, Arizona just a few miles from my home. I really wanted to attend but was hesitant to purchase a ticket because I would be going alone. Having never attended any type of blogging event before, I was unsure if I would get much out of it. Then I came across Groopdealz and saw they were selling discounted conference tickets. I bought my ticket and hoped for the best. I ended up having the most amazing time and meeting a great group of girls I now consider some of my closest friends. You can read my recap from the conference here. I have grown so much since attending that conference and I can honestly say I’m not sure I would be on this path had I not ventured over to Groopdealz and purchased that ticket. Did you know Groopdealz is currently celebrating their second anniversary with a HUGE giveaway? The prizes are amazing and three lucky winners will take home something awesome. 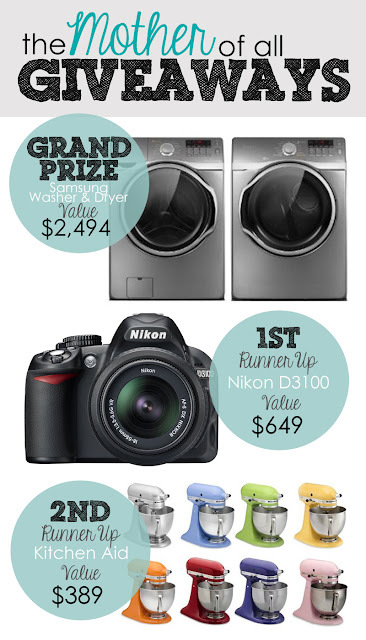 The grand prize winner gets a new Samsung washer and dryer. First runner up wins a new Nikon camera. The final winner will be cooking with a new Kitchen Aid mixer. Wow, wow, wow! Be sure to go to Facebook and thank their amazing friends that made this giveaway possible! All you have to do to enter is like all the Facebook pages of the blog friends that made this giveaway possible (listed above) and go to the original post on the Groopdealz blog (here) to submit your contact information. The giveaway is ending soon (winners will be notified by email 9/14) so you better hurry! Groopdealz has new deals daily so be sure to follow along on their Facebook page or on Pinterest so you don’t miss out on something amazing! *Groopdealz asked me to help spread the word about their giveaway but all opinions are my own.